Griffith Stairs Company provides expert installation of custom stairs for your home. Whether you’re planning a new home construction or an interior update or major home remodel, you can rely on our experience and expertise in materials, design and construction to get the job done right. Most new stair installations are completed in just a week or less and we approach every project with only the best, most durable and long lasting woods and finishes available. 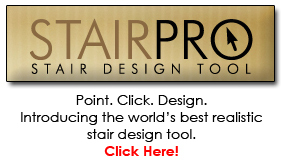 Contact us for a free estimate today so we can make your dream of custom stairs for your home a reality! No custom stair design is complete without the addition and enhancement of fine handrails and balusters. Griffith Stair Company can help you with the selection of handrails that will offer a perfect fit for your new or existing staircase. Since the options for handrails and balusters can be so varied, in terms of designs, materials and wood types, we will help you to save time and money by making appropriate recommendations that suit your tastes and budget. Contact us today for a free estimate and find out how our handrail and baluster designs can beautify and enhance your home. Owner of Griffith Stair Co.